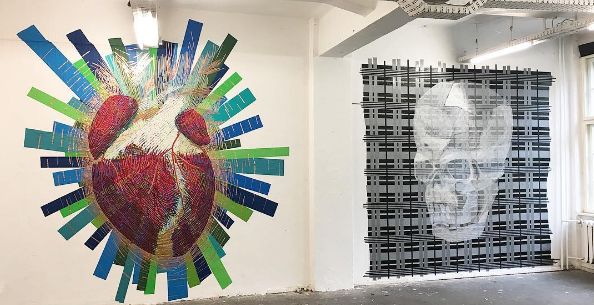 PCA&D adjunct instructor Jay Walker has just returned from exhibiting his work at the 2016 international Tape Art Convention at the Neurotitan Gallery in Berlin, Germany, which runs through November 5. According to the exhibition website, this first time joint exhibition of internationally renowned tape artists, is being held to showcase the diversity of this increasingly influential urban art form. Pictured above are Walker's two pieces in the show, The Heart II and The Death. 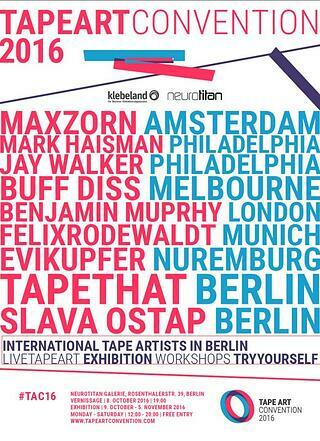 Walker was one of six artists plus members of the Berlin Tape Art Collective Tape That at the Tape Art Convention 2016. He was one of only two artists from the United States, along with Mark Kaisman, a Philadelphia artist originally from Kiew, Ukraine. A founder of the tape art movement, Australian artist Buff Diss, was also exhibiting at the show, which Walker described as a invitational exhibition, rather than a “convention” in the American sense of the word. Walker created his works directly on the gallery’s walls, as did some of the other artists. Others brought in boards and panels so they could retain their works after the exhibition ends. The exhibition focused on the interaction of artists and visitors, where the visitors witnessed the completion of some selected pieces. While there, Walker led a workshop (pictured, right) for aspiring tape artists. Artwork created by some of the artists attending Walker’s workshop is available here. 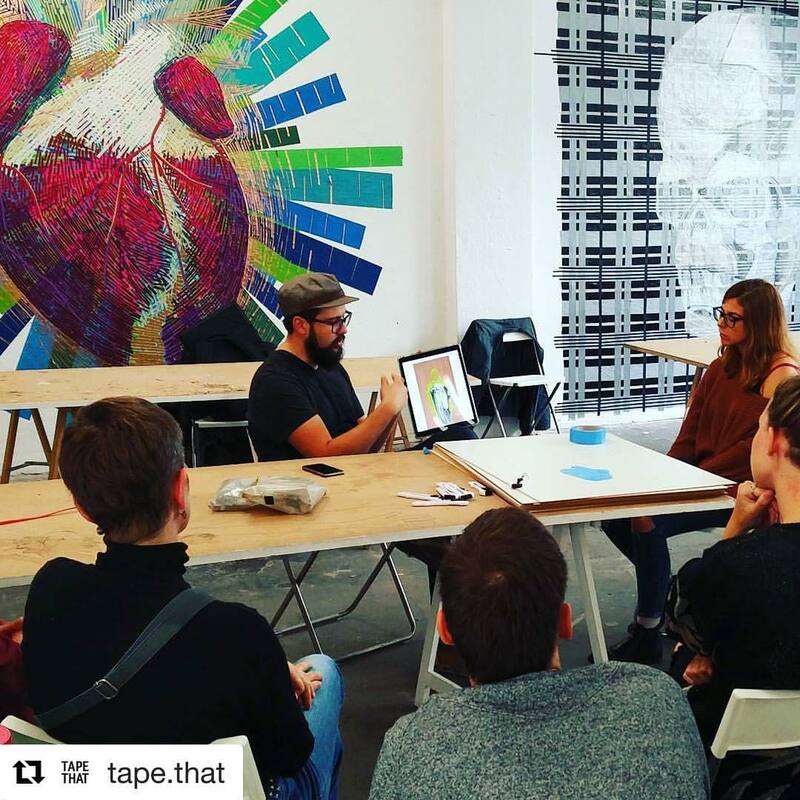 According to Walker, tape art is a very popular medium in Europe, especially Germany, and has grown out of the street art practice of graffiti. Tape art, a relatively new movement which is only starting to become noticed in North America, originated in the 1960s, is created with a variety of adhesive tape products, including painters tape, adhesive paint and duct tape, as an alternative to spray paint. The medium has moved beyond street art and into corporate board rooms and show rooms as an adaptable art form that can be configured for the space, and if necessary be easily taken down. Tape art is not his only medium. Walker, who earned his bachelor’s degree from Texas A&M - Corpus Christi and his MFA from the Pennsylvania Academy of Fine Arts, is currently teaching a Foundation level 3-D Design class at PCA&D. “I’ve always been into mediums - whatever I can get my hands on. 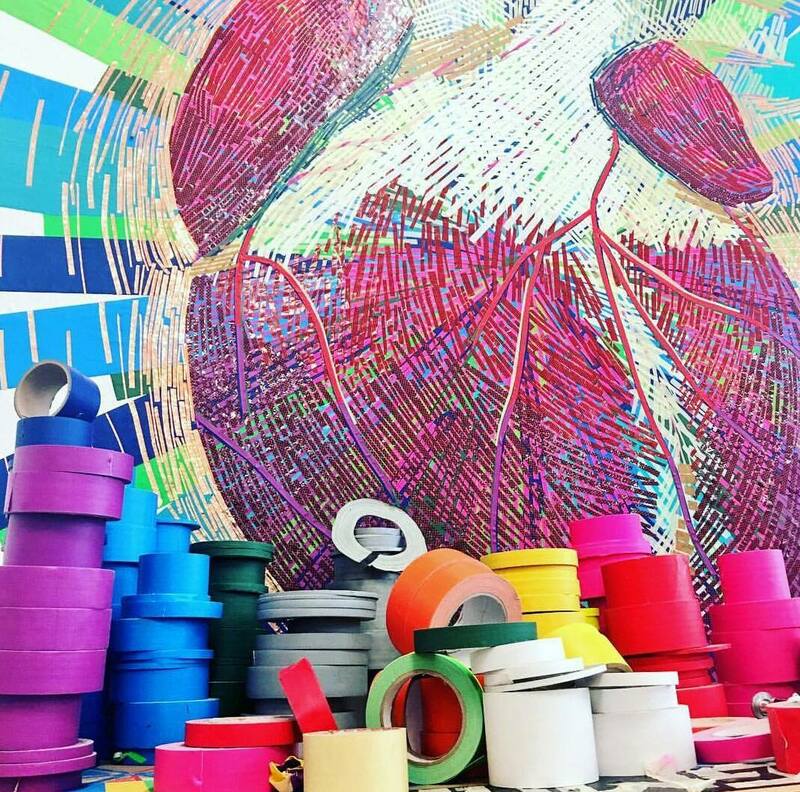 How do I create with it?” However, he hopes to spread awareness of tape art here in the United States. His tape art and other work can be viewed at his website. For those who read German, media outlet Dutchlandfunk published an article featuring a photo of Jay Walker installing one of his pieces. To watch tape art in action, below is the promotional video for the Tape Art Convention 2016, showing a work of art in progress by some of the exhibition's participating artists.